One of the most difficult feats to perform in watchmaking is constructing a tourbillon. This mechanical element improves precision by counterbalancing perturbations created by the Earth’s attraction on the balance’s regularity. The correction is made by having the balance and the escapement turn on themselves. In Switzerland these days, you could count on one hand the number of watchmakers capable of constructing it. So, a “homemade tourbillon” is a sure sign that the company possesses and masters watchmaking know-how. ZENITH is no longer content to resolve just one difficulty, no matter how complex it may be. Our tourbillon is combined with a chronograph calibre with a calendar – another watchmaking complication – and a high frequency, a third challenge. It is the only watch on the market with such a complex mechanism, aiming to attain the most precise chronometric performance possible. 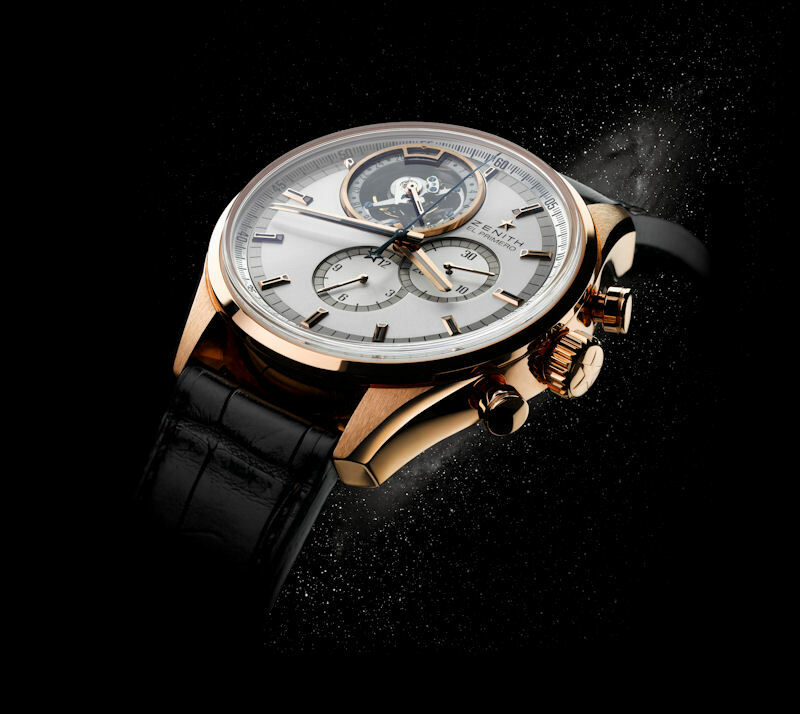 Furthermore, its value for the money is unequalled on the market, for a truly exceptional piece of timekeeping that joins the family of Zenith ’s iconic models — taking pride of place. This tourbillon is unique in more than one way: it shows off its rotating carriage in the upper left-hand part of the dial, including a built-in calendar. This asymmetry aesthetically highlights the tourbillon’s mechanism, visible through an opening in the dial, while maintaining fine proportions and elegant lines. The date is displayed – in a patented system – by means of a disk around the circumference of the carriage. 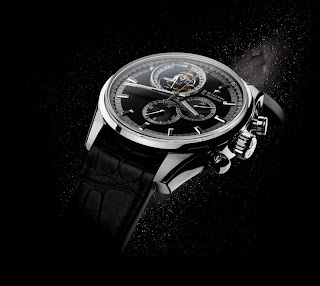 The El Primero chronograph’s automatic calibre is the heart of the movement. While the high frequency assigned to this exceptional motor generates greater precision, it also demands increased power. To protect performance, ZENITH designers have developed an in-line escapement that shifts the balance spring to the outer edge of the rotating carriage. The result is a tourbillon and a high-frequency automatic chronograph with over 50 hours of power reserve. 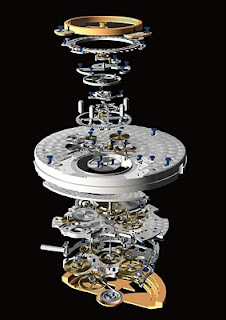 The calibre is composed of 381 components, including 67 for the rotating carriage. Yet, it is barely 1 mm thicker than the original El Primero. The only tourbillon on the market that operates at high frequencyThe tourbillon comes in two models: steel or rose gold, with counters at three and six o’clock. The seconds hand in the tourbillon carriage rotates with it in 60 seconds. A true mechanical masterpiece and a technical exploit, to date, the ZENITH tourbillon is the only one to beat at a high frequency, with a quarter more vibrations of its balance than other constructions. Let us examine the unique characteristics of the ZENITH tourbillon. The case’s middle is formed using a double stamping process, which creates one curve at a time along the length and depth. The olivette makes it easier to grasp the crown. The magic of the calibre in movement can be seen through the Sapphire glass. So, if you love chronometric feats, you are going to adore this watchmaking creation. · Finishings: 18 carat Gold or metal oscillating weight with «Côtes de Genève» pattern.